Tempe fire crews work to put out blaze at Rural and Baseline roads in Tempe. TEMPE — Tempe fire crews say a massive fire that destroyed a popular Valley restaurant was caused by unextinguished cigarette butts. According to officials, the fire broke out at Doc and Eddy's located at 909 East Minton Drive around 6 a.m. on Sunday morning. All occupants inside the building were able to safely exit, and no injuries were reported. 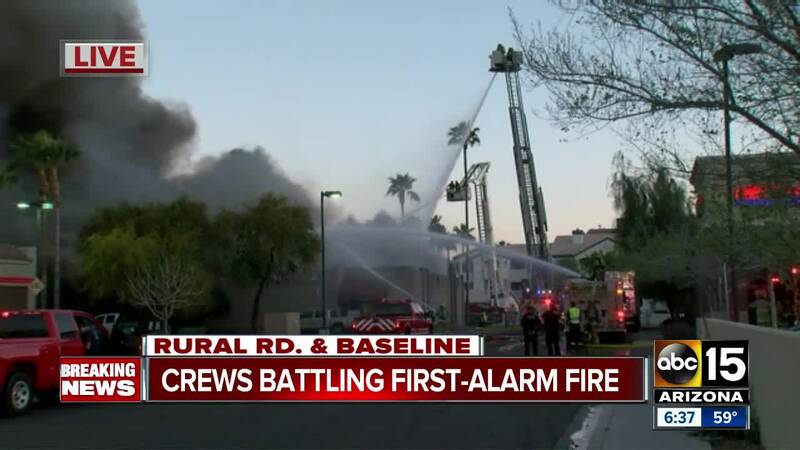 Tempe fire officials say the building did not have a sprinkler system installed "due to the time it was built and the fire code it was under." "If sprinklers had been present, the fire damage would have been less significant," Tempe Fire Interim Assistant Chief Andrea Glass says. There is extensive damage to the building, according to Glass. Sean Cleary has been the general manager of Doc & Eddy's for 20 years. Cleary says two employees were in the restaurant at the time when the fire started. Investigators are still working to find out the cause. "They heard some noises and they grabbed some fire extinguishers but no luck," Cleary said. Cleary says they have plans to rebuild. "We'll be eating corned beef and cabbage on Saint Patrick's Day at Doc and Eddy's next year," said Cleary. Over 30 people were employed at Doc n Eddy's before Sunday's fire. A GoFundMe account has been set up to help raise money for employees and rebuilding efforts.